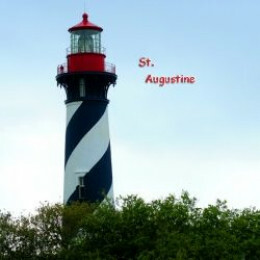 I love photographing lighthouses, so I went to St. Augustine specifically to photograph the lighthouse. I was pleasantly surprised by a wonderful, historic ciy with many wonderful attractions. We were only there for one day so we really only touched the surface of all of the sites to visit. I spent quite a bit of time photographing the lighthouse and touring the lighthouse museum. Afterward we went to the Castillo de San Marcos, an old Spanish fort that is right on the inlet. We also spent some time walking around the downtown area and taking in the many historic buildings. St. Augustine is truly a historic treasure. It was settled 55 years before the pilgrims landed at Plymouth Rock and is full of hundreds of years of fascinating history. 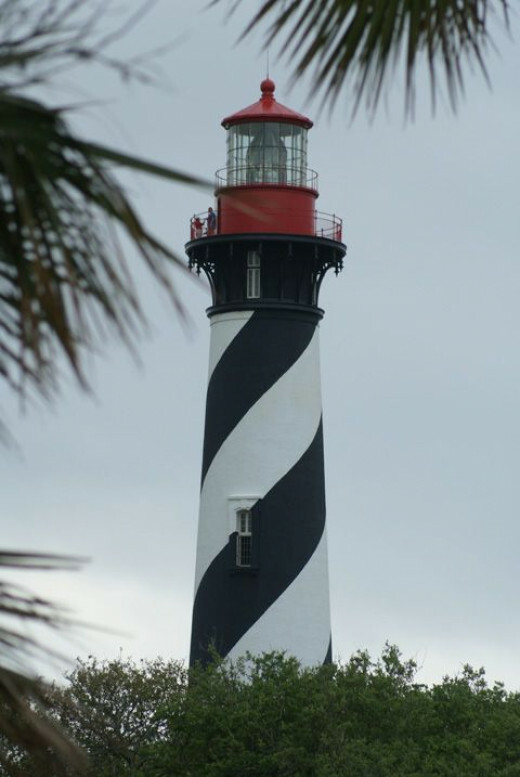 This page will give you a photographic tour of the lighthouse and the Castillo de San Marcos. Here is the first photo I took of the lighthouse from the parking lot. The way the lighthouse is surrounded by trees it is hard to get a good shot of the lighthouse without being right on top of it. In this lens you will see my challenge at trying to get a good shot of the lighthouse. I moved around to various spots within the lighthouse grounds and even tried to shoot from across the way in a park. If you have a favorite view I would love to hear from you. Just let me know in the comment section at the end of the article. 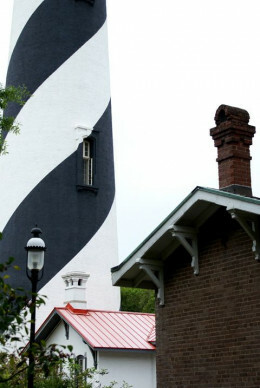 St Augustine Lighthouse is a beautiful sight with it's black and white stripes spiraling up the lighthouse. The lighthouse has a wonderful museum that tells the history of the lighthouse and shows a great timeline of the history. This photo was taken from the porch of the museum, directly across from the lighthouse. It was one place I could get an unobstructed view of the lighthouse with the little house in front of it. I'm still a bit close for comfort and it gives a distorted look to the tower. 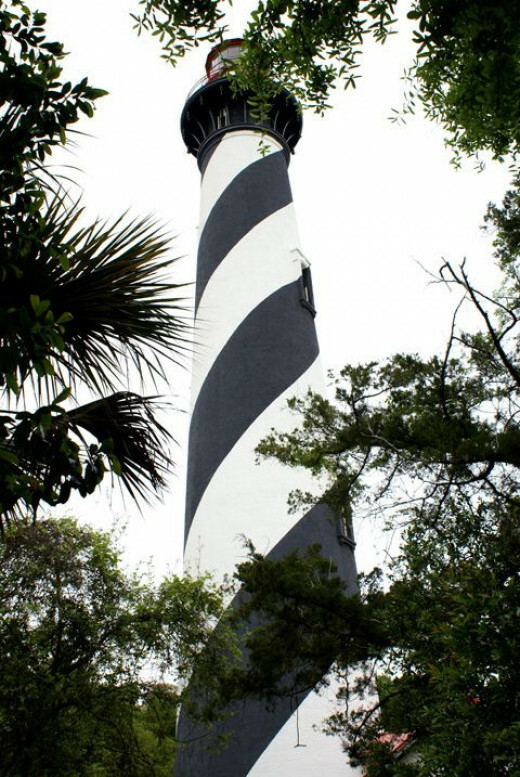 St. Augustine lighthouse has a 165 ft tower. Visitors are welcome to climb the 219 steps to the top. While we were visiting the lighthouse, there was a local artist painting an oil painting of the lighthouse. When I finished touring the grounds and museum I stopped to look at what he had been painting. I snapped this photo from the same angle the artist was using to paint the picture. It gives a closeup point of view. Interesting...although I will admit it looked much better in the oil painting. The grounds of the lighthouse have trails through the woods that go up and down hills. I explored one of the trails looking for a view of the lighthouse. 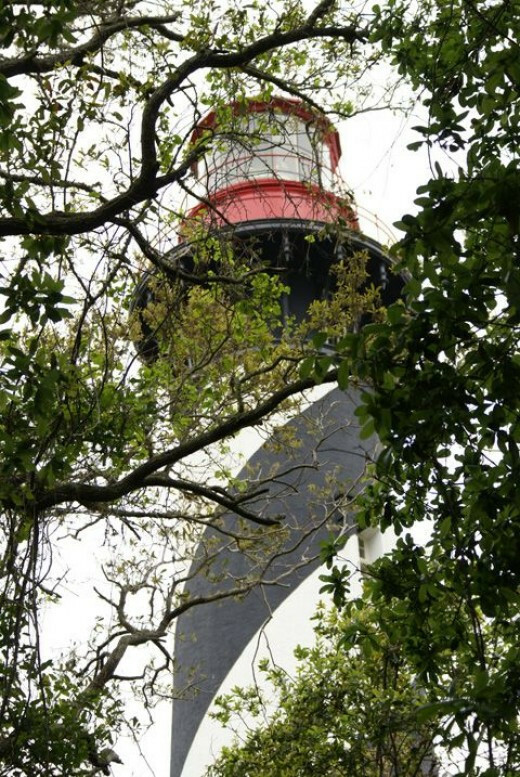 This photo was taken of the lighthouse through the trees. 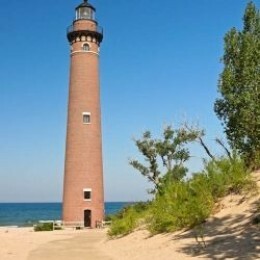 There is a park not far from the lighthouse where you can get some great views of the lighthouse. 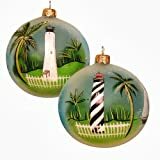 With my telephoto lens, I was able to capture the lighthouse framed in palms. You can even see a few tourists enjoying the view from the top of the lighthouse. We stopped by St. Augustine on another trip to Florida and I was able to capture the lighthouse at night. The lighthouse is surrounded by buildings and trees so to get a good shot of the light at night I went to a nearby park and set up my tripod. This wonderful old Spanish fort was constructed between 1672 and 1756. It was made from coquina, a local shell-rock formation. 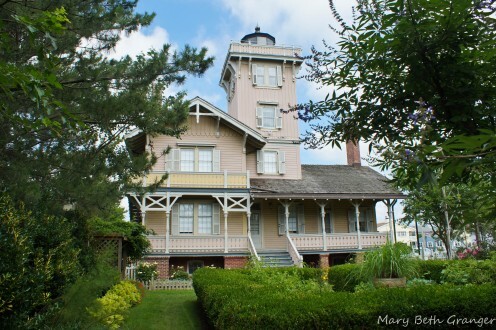 Hereford Inlet Lighthouse is located along the New Jersey shore in North Wildwood. 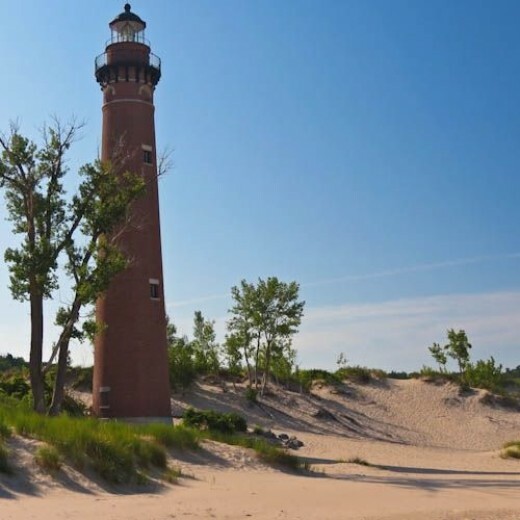 This gorgeous Victorian style lighthouse is a photographers dream. It not only has a beautiful Victorian home with a lighthouse incorporated into the house, but the surrounding property is full of beautiful gardens, special little hideaways, and a path leading right to the sea. 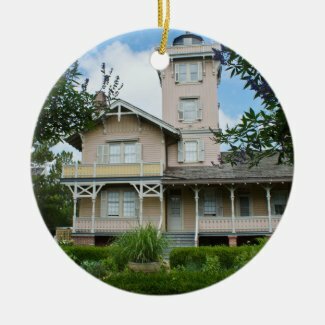 I found this lighthouse particularly interesting because it looked more like a beautiful Victorian home than a lighthouse. Inside the home it has 5 fireplaces and a very well maintained living quarters for the keeper and his family. This must certainly rate among the nicest keepers quarters for lighthouses. All photographs in this article are my own-mbgphoto. 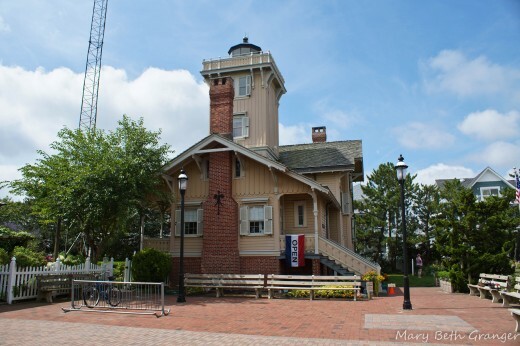 The lighthouse was first operated in 1874 to guide ships along the New Jersey shoreline. 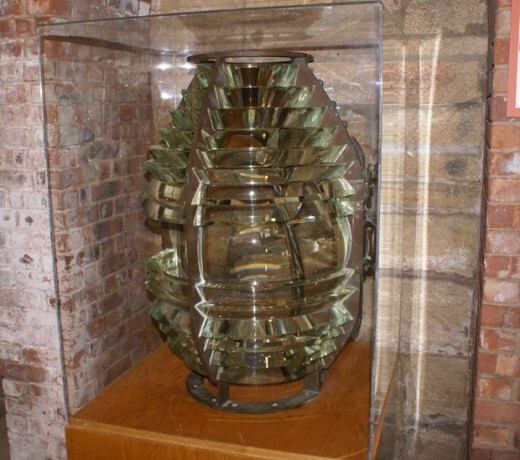 This distinctive lighthouse helped navigators to pinpoint where they were located along the shore. This lighthouse is very sturdily constructed. In 1889 when a ferocious hurricane blasted the area many people were washed away and drowned. 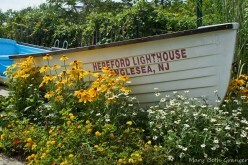 Those people that survived took refuge in the Hereford lighthouse. Even though it was surrounded by water and shaken by the high winds the lighthouse and18 people who took refuge in it survived. ( information on this event taken from Mid-Atlantic Lighthouses by Bruce Roberts and Ray Jones). The lighthouse remained in service for 90 years at which time it was discontinued by the Coast Guard in 1964. It sat unused until 1986 when the citizens of North Wildwood opened it again. Have you ever visited a Lighthouse? 42% Oh yes I have visited many lighthouses, they are great! 42% I have visited a few lighthouses and would love to see more. 17% No, but they are on my list now. 0% Why would I want to see a lighthouse...just another building! 12 people have voted in this poll. 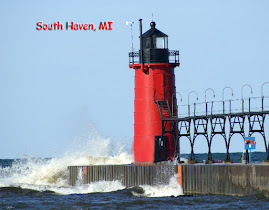 I have always loved lighthouses, but 8 years ago when I retired my love of lighthouses really heated up. It started with a love to travel and improve my photography skills. The first year of my retirement my husband and I visited Door County, Wisconsin and I took some photos of their lighthouses. I found each one to be different and intriguing and my quest to photograph more lighthouses started. Over the years we have photographed over 100 lighthouses and each year I am looking for new opportunities to capture these beautiful, historic lights with my camera. Our trip to the New Jersey shore gave me the opportunity to add 6 new lighthouses to my photographic collections. The gardens all around the lighthouse were beautiful. 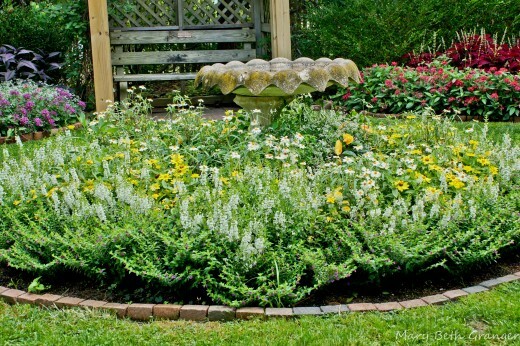 The flowers were well maintained and there was a huge variety of flowers artfully set among small sitting areas. You would walk along a path and be surprised by each little area. 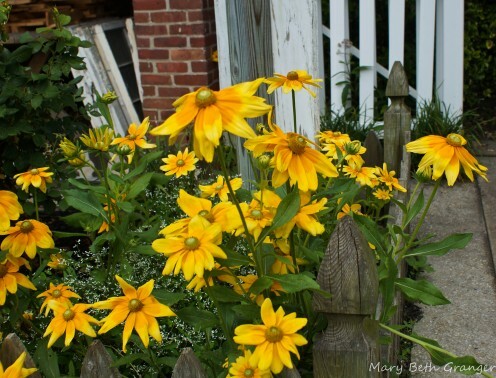 One area had a birdbath surrounded by flowers, another would have beautiful hydrangea bushes, and still others would have bright yellow daisy type flowers bordering the house and fence. There were so many wonderful little areas to explore. 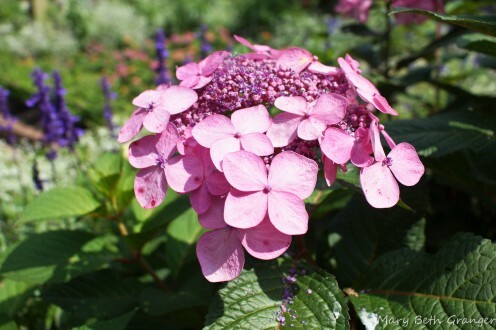 It was truly an unexpected and delightful garden. 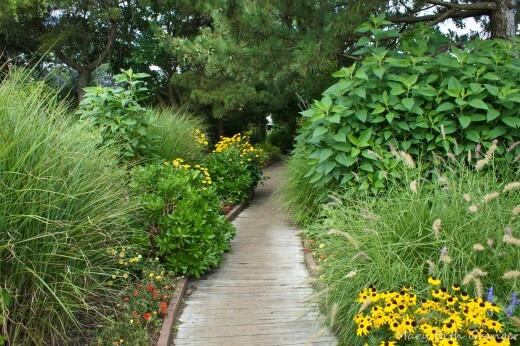 One of the things that I loved about the garden was the pathways that led you from one section to the next. 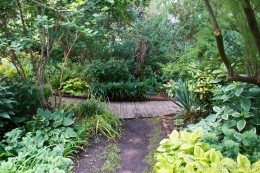 These pathways were lined with beautiful greenery and flowers and were found throughout the back area of the grounds. There was a wooden pathway that went from the house to the very back of the property which then opened up to a concrete boardwalk that went along the sea. What a great way to spend an afternoon. I walked from the gardens out onto the boardwalk and could watch the sailboats drifting out to sea. A truly delightful walk. Towards the back area of the gardens, I came across two different old boats. Theses boats looked like they had seen better days and were now used to showcase the flowers around the garden. 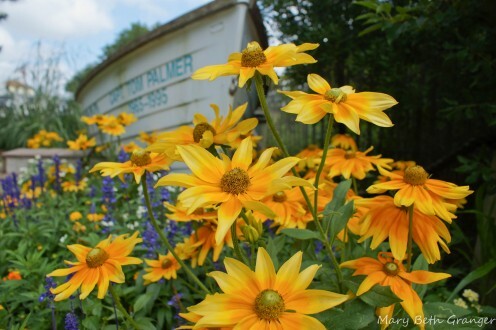 Each of the boats had a wooden bench sitting across from it and beautiful flowers growing all around the boat. 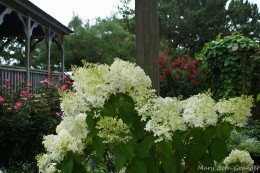 I took some time to sit on the bench and rest before I started photographing the boat and flowers. 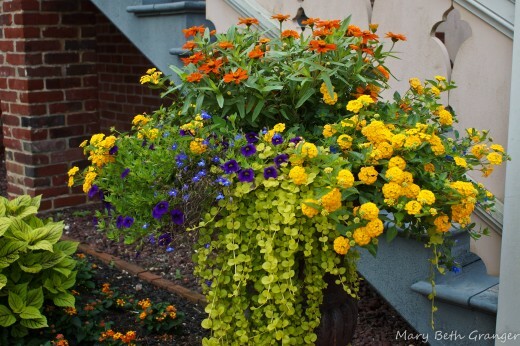 What a great way to add interest to the gardens! When we visited Hereford Inlet we were staying at Atlantic City. The lighthouse was about a half hours drive from our hotel. 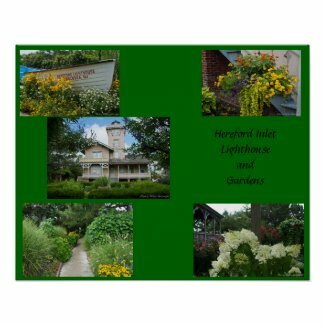 I love to use my photographs to make gifts for my Zazzle shops. 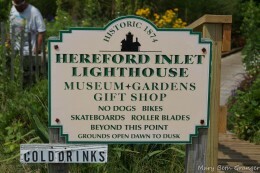 Below you will find several gifts from photographs of the Hereford Lighthouse. I love photographing lighthouses and in the past eight years I have visited over 100 lighthouses. Digital cameras make it so easy to take lots of photos and at first I just took photos of the lighthouses from various angles. As I learned more about photography and started to use various cameras and equipment I started to look for unique shots. I love to take sunrise and sunset photos and with my DSLR camera and a good tripod, I have learned to take some interesting shots. I know taking early morning and early evening photos gives me the best light, but sometimes when traveling visiting a lighthouse during those times is just not convenient. On our trip to Michigan in July of 2012 we were visiting 10 lighthouses in a weeks time so I was visiting some lighthouses during daytime and sunny times. My challenge was to find a way to take an interesting and unique photo of the lighthouses during that time period. 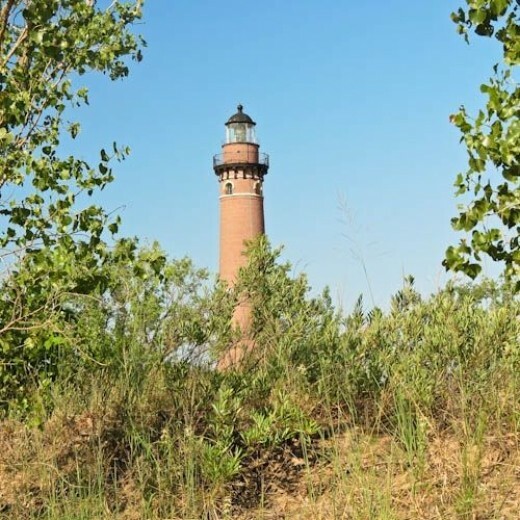 On this page I will introduce you to the photos I took of Little Sable Point lighthouse on the shores of Lake Michigan. 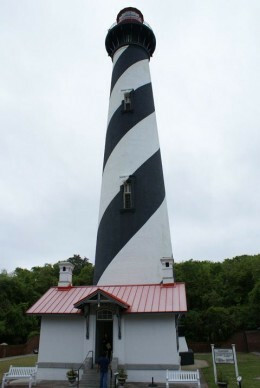 Little Sable was erected in 1874 and is a classic tower shaped lighthouse. When we arrived at Little Sable it was about 9:30 in the morning and the sun was already fairly high in the sky. It was a clear day without a cloud in the sky, so I knew I would need to find just the right angle for the photos or the sky would really look washed out. From the parking lot you could see the lighthouse through the dunes and brush that grew in the dunes. This first shot that I took shows the lighthouse framed by some bushes. I always like to frame the photos. I think it gives the photo a good balance look so I was glad to see some trees and brush with which I could work. 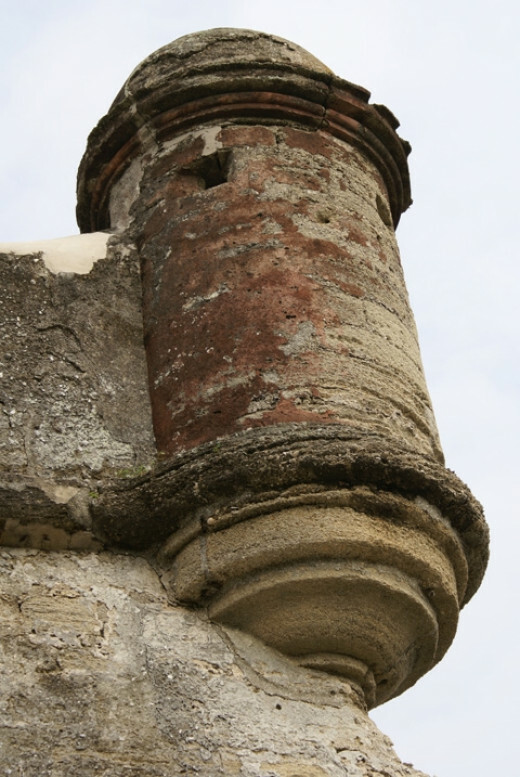 The resulting photo is above. I think it is a good photo, but not quite the unique shot I was looking to create. 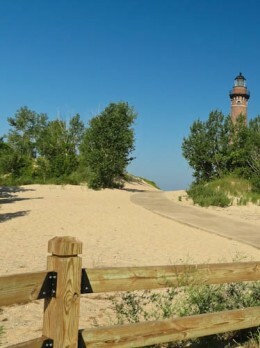 The photo below uses the winding path to draw your eye up to the lighthouse. This is another technique I like to use. I also like putting something in the foreground (the fence) to give it depth. Again, I feel it is a good photo, but doesn't quite have that unique quality. This is the camera that I used for all the photos on this page. I got the camera a couple of weeks before our trip and I was eager to try it out. I was very pleased with my results. The camera takes clear, crisp photos and has a wonderful zoom lens. 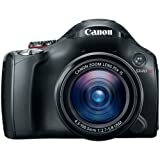 It has a variety of automatic and manual settings and is very lightweight. It is a perfect camera to use when traveling. I next walk up and down the beach looking for a view of the lighthouse that might lend to a unique photo. 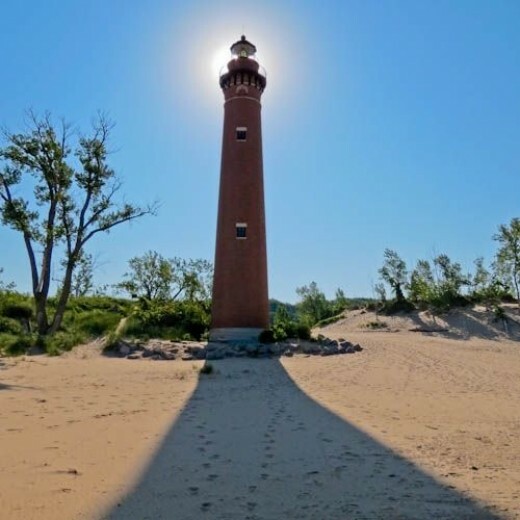 I liked the way the mid morning sun was casting shadows on the lighthouse and the dunes. I saw that it was right behind the lighthouse but at this point that didn't strike me as a good shot so I moved to this shot of the lighthouse and the dunes. I like this shot better than the ones from the parking lot, but it was still not quite what I wanted. 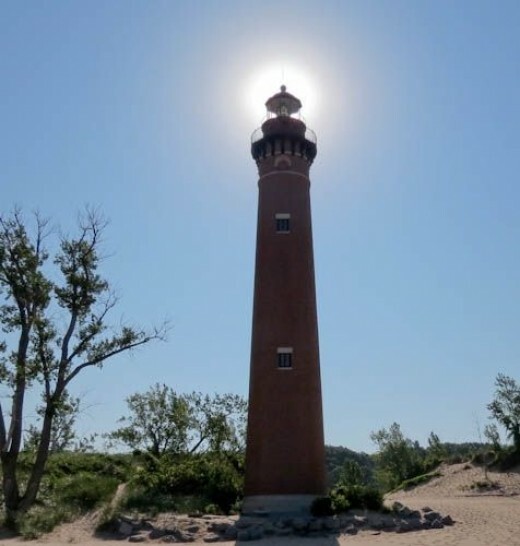 As I walked back in front of the lighthouse on the beach I noticed that the sun was now right behind the top of the lighthouse. I thought this might make a nice photo, so I stood in the shadow of the lighthouse and lined up my shot. I focused on the lantern of the lighthouse to get the desired effect and then lower my camera to get the whole lighthouse in view. This is the resulting photo! When I got back to our hotel room and loaded my photos into my Photoshop Lightroom program, I decided to try to crop the shadow out of the photo for a different effect. I next decided to do a bit of manipulation of the photo in Lightroom. For this view I worked on getting the new trendy, high contrast look. This look doesn't look good on all photos but I like the way it looks on Little Sable. I think it gives it an eerie, haunted look! I have mixed feelings about my unique photo and actually I like all three versions. I know some people are purists and feel that photos should not be manipulated and others feel that it is part of the artistic license. I enjoy seeing the photos both ways. 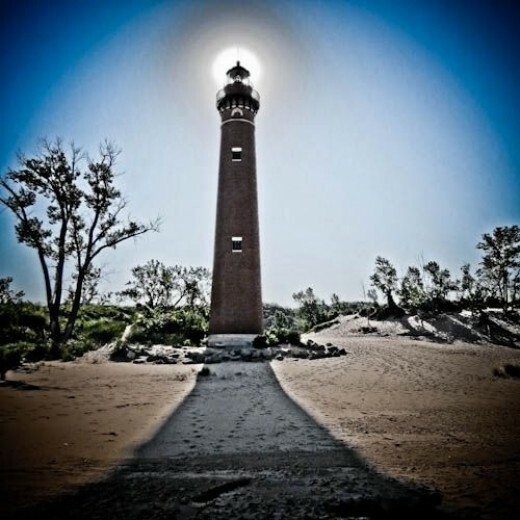 Which of the Sun behind the Lighthouse Photos do you like best?